OMA&D adviser and Rome Program alumna Annabel Cholico relives her study abroad experience through the eyes of her students. The first time Annabel Cholico, ’08, stepped off of a plane, she felt like she was in an Italian movie. It was 2007, and Annabel, a junior Law, Societies & Justice major, was on her way to the UW Rome Center for a 10-day trip that would change her outlook on learning and life. A first-generation Latina student from Yakima, WA, Annabel is an alumna of the Rome Academic Enrichment Program sponsored by the Office of Minority Affairs & Diversity (OMA&D). Celebrating its 20th anniversary this year, the program began as a partnership between the Department of Classics, UW Rome Center and OMA&D. James Clauss, professor of classics, initiated the program in 1995. For Annabel,the time spent together with her OMA&D Rome cohort was “a very diverse and rich experience for all of us. We all looked and sounded different,” she says. “It was great to learn about each others’ cultures while you’re in a place that isn’t really attached to any of us.” The relationships she formed are lasting; Annabel is still in close contact with several members of her cohort, some now as far flung as Dubai. “Its great to see us now, years later, and see what that experience abroad did for us,” she says. Annabel was nominated to participate in the program in 2007 by her OMA&D adviser, Raul Anaya. Today, she sits two doors down from him, counseling her own students. 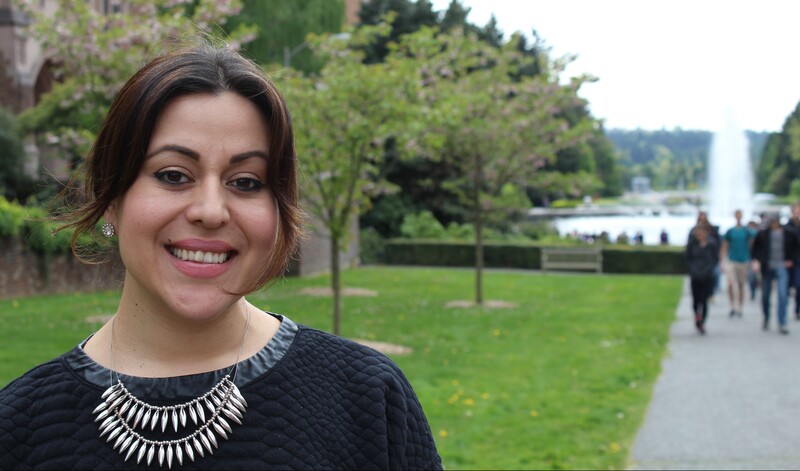 Annabel earned her master’s in education policy from UW. When an academic counseling position at OMA&D opened she was thrilled. “I am in the perfect place because I’m a product of this office, I’m a product of all the programs I experienced, like Experience Rome,” she says.